The Centre for Policy Studies, a leading think tank, has proposed that the UK Government should hand its stake in Lloyds and RBS to the citizen taxpayers. If this happens then, for the first time in decades, a bank would actually be majority owned by ‘small shareholders’. The banks would only accept this if the shares were handed over without any voting rights, for fear of what would ensue at their Annual General Meetings (AGM). AGMs are traditionally stitched up between the big financial companies who hold the bulk of one another’s shares in the pension and investment funds they manage on our behalf. Scratching one another’s backs, they follow an iron-clad policy of “no pay package left behind”. I'll vote for your package if you vote for mine. One reason for the Government’s hurry to get rid of its shares in RBS and Lloyds is holding them is so embarrassing – showing up the fact that all its heroic talk about reining in excessive pay is nothing but hot air. No more evidence is needed than the dismal performance of UK Financial Investments Limited (UKFI), the government body that manages the shareholdings, at the RBS and the Lloyds Banking Group Annual General Meetings in the last month. PRESS RELEASE 18th May 2011: Statement re: Lloyds Annual General Meeting UKFI has lodged votes in favour of all resolutions at the bank’s Annual General Meeting on 18 May. PRESS RELEASE 19th April 2011: Statement re: RBS Annual General Meeting UKFI has lodged votes in favour of all resolutions at the bank’s Annual General Meeting on 19 April. If one more shareholder had voted against the Lloyds Banking Group’s executive pay proposal then there would have been a 49.11% against. As it was, the contrarians mustered just 8.11%. If one shareholder had voted against the RBS executive pay then it would have been thrown out. Who was this weighty shareholder? The UK government, with its 41% stake in Lloyds Banking Group, and its 83% in RBS bank. Options granted up to March 2001: “Lloyds Banking Group plc’s ranking based on total shareholder return (calculated by reference to both dividends and growth in share price) over the relevant period should be in the top fifty companies of the FTSE 100.” You have to come in worse than fiftieth out of a hundred to lose your bonus. Options granted from August 2001 to August 2004: “The performance condition was linked to the performance of Lloyds Banking Group plc’s total shareholder return… against the comparator group was required to be at least ninth.” There were 17 companies in the comparator group. Come in ninth out of seventeen, and you were in the money. Options granted in 2005: “the performance condition was linked to the performance of Lloyds Banking Group plc’s total shareholder return… If Lloyds Banking Group was ranked below the median (ninth or below) the options would lapse.” There were 15 companies in this comparator group – so long as Lloyds was better than ninth position, they were in the money. “Where the Group’s total shareholder return was below the median of the comparator group, the TSR Award would lapse. The relevant period commenced on 8 March 2007 and ended on 7 March 2010.” To lose your bonus, the bank would have to be in the bottom half of the comparator group. When the companies crash, the rules for bonuses are changed! The story at RBS, where the government owns 83% of the shares, and voted in favour of the pay and bonuses, is just as tragic. Bonuses are paid not for “excellence” but for “better than average”. The RBS comparator group comprises twenty companies – if RBS comes tenth then bonuses are paid. 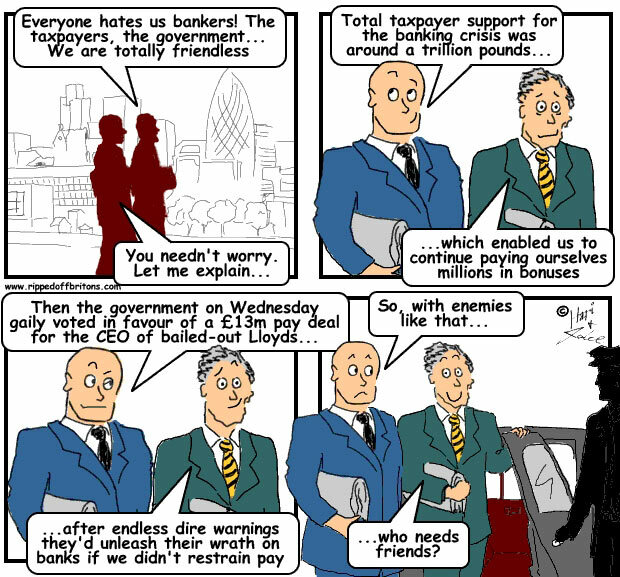 To be fair to bankers, its not just them. All the FTSE firms thrust money at their bosses regardless of the performance of the companies. The High Pay Commission report shows that CEO pay has soared, while the value of their companies has stagnated. "There is widespread concern that inappropriate remuneration schemes, particularly but not exclusively in the areas of investment banking and trading, may have contributed to the present market crisis. In the private sector, bodies such as the Counterparty Risk Management Group (CRMPG) have identified remuneration structures as one of the possible driving forces behind current problems. The International Institute of Finance (IIF) reached a similar conclusion.."
"The FSA shares these concerns. It would appear that in many cases the remuneration structures of firms may have been inconsistent with sound risk management. It is possible that they frequently gave incentives to staff to pursue risky policies, undermining the impact of systems designed to control risk, to the detriment of shareholders and other stakeholders, including depositors, creditors and ultimately taxpayers." "Be not afraid of greatness; some are born great, some achieve greatness, and others have greatness thrust upon them." As is said of greatness, so it is with wealth and the three ways of achieving it. Great leaps have been made in the science of genetically selecting the embryos that become your children. Do you prefer a boy, a girl, an intellectual, green eyes – millions are invested producing new and better ways of being a little bit more certain that your heirs will be just so. However, as far as I know, there has been no progress at all in genetically selecting your parents. Arranging to be born rich is still beyond our reach. You just have to trust to the lottery of birth. Achieving great wealth, on the other hand, is mainly about hard work. It helps to have an excess of many of those good characteristics – talent, perseverance, self-belief and the like. It helps even more to have a superfluity of many of the worst characteristics – greed, ruthlessness, selfishness. And, quite frankly, it helps a lot to be born rich in the first place. But having wealth thrust upon you! Those who became rich at the point of a sword, or built their wealth by owning the means of production, or simply inherited their money, are now being joined by those whose targets are set at achieving mediocrity. Executives who have managed to convince remuneration committees to thrust money at them for achieving "median" (i.e. average) performance..
Reported by FT in May 2012: "Strategic Value Partners, the $4bn hedge fund specialising in distressed debt investing, is understood to have hired former UK Financial Investments chairman Sir David Cooksey for its advisory board."